The Space Mountain speed, for the indoor roller coaster at Walt Disney World Resort, is approximately 28 miles per hour (mph) (maximum) according to various sites. 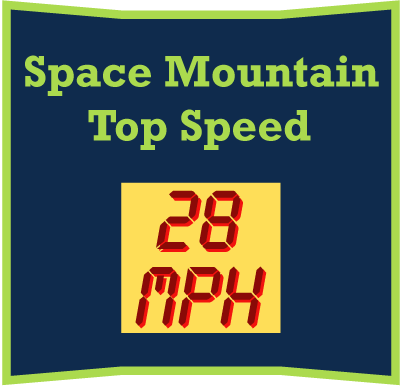 The Space Mountain top speed or max speed is 28 mph. This is the max velocity of the Space Mountain Walt Disney World indoor roller coaster that is located in the Magic Kingdom at Tomorrowland. Currently we do not have information on the average speed for the roller coaster, however, we expect that the average speed is not that much lower than the 28 miles per hour top speed. Below are mesurement conversion and an overview on how Space Mountain is not the fastest ride in the Magic Kingdom. The following are conversions to kilometers and other measurement rates from the 28 mph speed. Featured above is a sign or drawing of Space Mountain's max speed. Other rides in the Magic Kingdom have higher top speeds. For example, Big Thunder Mountain Railroad in Frontierland has a max speed of 35 mph. This is interesting as it feels like Space Mountain is a fast ride that could be comparable in speed to Big Thunder Mountain Railroad. However, when thinking about the ride it becomes apparent that it is actually not that fast. Even with its 28 miles per hour speed, Space Mountain is still one of the top rides at the Magic Kingdom. It is definitely a ride everyone can enjoy, if you are not afraid of riding a roller coaster in the dark. To learn more about Space Mountain visit the other pages here on the site.